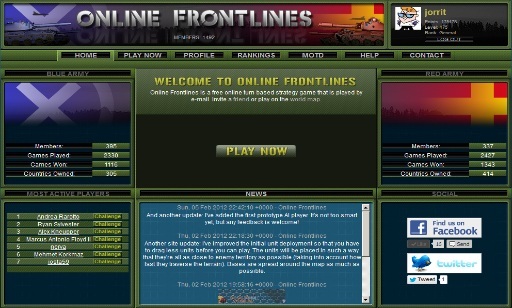 Online Frontlines is a turn based strategy game that you can play in your browser. The biggest difference with other strategy games is that you can see the entire map on one screen and you cannot create new units. You play the game online versus someone else. You can either play through mail or you can play live. I programmed the whole site using Flex (Flash 9), Java 6, Tomcat 5.5 and MySQL 5.0. The web site is no longer active, but you can still play against yourself here.